Speeding in a Construction Zone | Cook County, Illinois Construction Zone Speeding Lawyer The Davis Law Group, P.C. Contact Chicago Criminal Defense Lawyer The Davis Law Group, P.C. The defense attorneys at The Davis Law Group, P.C. handle a variety of traffic charges including Speeding in a Construction Zone. Under Illinois law (ILCS 5/11-605.1), there are enhanced penalties for speeding in a construction zone. A first violation of this statute is a petty offense with a minimum fine of $250 (plus an additional $125 paid to a special fund). A second or subsequent violation is a petty offense with a minimum fine of $750 (plus an additional $250 paid to a special fund). A second or subsequent violation within 2 years of the date of the first violation will result in a 90-day suspension of the offender’s driver’s license by the Illinois Secretary of State. 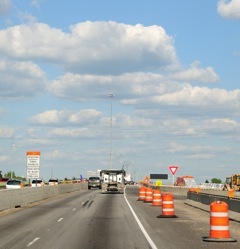 Automated traffic control systems (photo enforced) are now present in many construction zones throughout Illinois. Tickets issued by these systems are sent by mail and include a photograph of the driver. The State must follow specific requirements in the issuance of these violations. A traffic attorney may be able to fight the ticket based on these technicalities. Because tickets for speeding in a construction zone can be costly and result in a license suspension, hiring an Illinois traffic attorney is highly recommended. Feel free to contact the lawyers at The Davis Law Group, P.C. if you have received a construction zone violation.